Seasons unfold, pages evolve. That’s what happened here as I sketched a variety of fall fruits and seeds from the trees in our yard over the last few weeks. It’s all part of learning what’s here on the rural property we moved to in July. There are nice old sugar maples, red and white oaks, black walnuts, cottonwoods, birches, and white pines, with well-placed dogwood, pin cherry, and apple trees. There are many year’s worth of sketches in the trees alone…and you’ll see more in the future, I’m sure. Tips & Techniques– Just as seasons evolve, your pages can too. While it can be nice to finish a page all at once, sometimes that just doesn’t work. Be patient. Do a little at a time, leave it, come back, and do more. Your most important decision is probably where to place the first object. Avoid the middle of the page, which tends to lead to a dull design and leaves only tight spaces around the center to fill. If you know you have a larger item (e.g., black walnuts vs. acorns), place it sooner than later. You can always find room for small things after the big ones are in place. 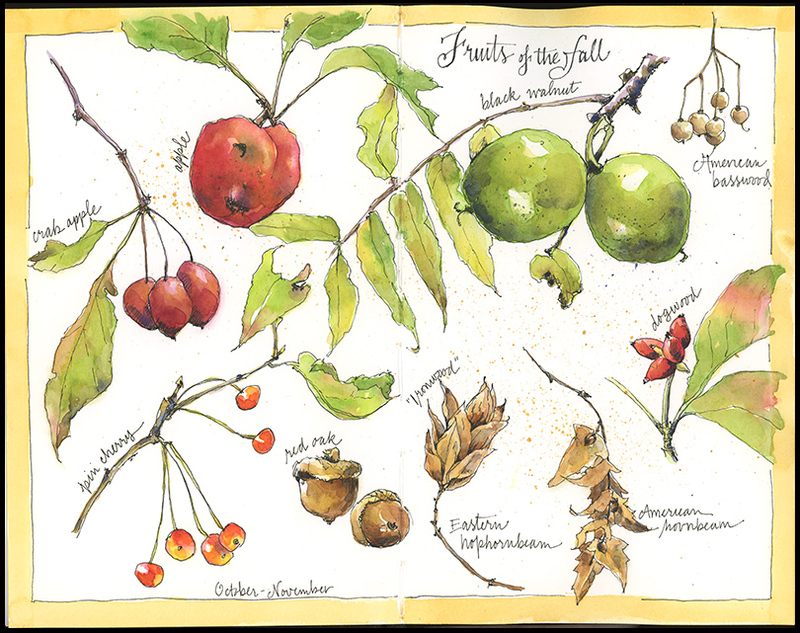 This entry was posted in Journal, Trees and tagged Autumn, field identification skills, nature, sketchbook, trees, watercolor sketch by Jean Mackay / Drawn In. Bookmark the permalink. Jean, your journal entry today is exquisite. I love the layout and watercolor. Thanks for the tips. Thanks Sharon! Glad to hear from you; it’s nice to be able to learn and share and see what folks are up to on their blogs. As always, a beautiful page and some much appreciated solid advice on your creation process. Thank you! You’re very welcome! And don’t hesitate to ask if you ever have questions about the process that I don’t address. Thanks! The funny thing is that I nearly abandoned this page early on because I wasn’t happy with the initial stages of painting. I later decided to push through and see if I could see it save it. Glad I did! Thanks for sharing with us you know i am a new but when i read your blog really i am very impressed with your page..
Thanks…glad you like what you see here. I look forward to seeing future posts of lovely sketches of scenes occurring on your new property. It’s a great place to be– and there is so much to learn and sketch here. I’m excited to be in a place that offers so much. well that’s just damn gorgoeus!! Have a great week! Thanks- I appreciate your enthusiasm! Your sketches are just great. I love the details on the branches. The advice about the middle of the page is precious. Thank you for sharing this process. You bet. Appreciate your positive feedback! It’s all gorgeous, but you REALLY nailed that apple! And we know how hard apples can be! I struggled with that apple Melissa, as always, so I’m glad you think it works! My blog is really about the artwork first and the writing second. I guess my hope is that the writing adds a touch to the painting. Thanks for your appreciation. 😍but the writing is good too. Yes indeed! It is a wonderful thing. Excellent tips. I plan to share this post with my cousin who is, apparently, into watercolour.